Standard Parcels - Delivery is priced at £8 in zone 1 (England). We deliver small items via Parcel Force. Large Parcels (Normal Delivery) Delivery is £35 for orders £399 and under and FREE for orders over £399 in zone 1 (England). 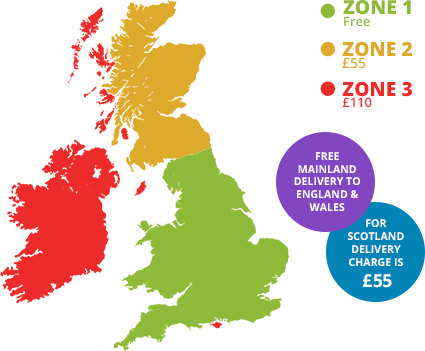 All standard and large parcels delivered to post codes in zone 2 (Scotland) are charged at £55. For orders over £399 there is a reduced delivery charge of £35. All standard and large parcels delivered to postcodes in zone 3 (Offshore) and some Scotland postcodes IV, KW, PA, and PH are charged at £110. Products listed as Special Delivery (i.e. Bath Panels and Shower Panels) are charged at £35 per order. Products such as Wet Walls and Shower Walls are charged at £35 per item for specific areas, all other areas POA. It can be a pain when you find the products you want at a great price and then have to add postage expenses to the overall cost, that’s why Bathroom City keeps delivery costs to a minimum and also offers free delivery on orders of £399 and over to England and Wales (inland), as well as discounted delivery on some products. At Bathroom City we understand that timing your delivery with the date you book your plumber can be a pain, so for situations that require a quick delivery we also offer an overnight delivery service. Overnight delivery is available at a small extra cost depending on your location, simply make your order online and contact our team to upgrade. If you would like to take advantage of our overnight delivery service then please contact us on 0121 753 0700. EXPORT - Please contact us direct for shipping costs. Some items may not be in stock and will have to be ordered from our suppliers, this may generate a longer lead time to receive your order. If you are not sure the products you have chosen are stocked please call for details. Bathroom City’s transport department will contact you a few days before the expected delivery date to confirm that you are ready for the goods. Somebody needs to be at the delivery address on the day of delivery because the carriers will require a signature for the goods. We must stress even at this point you are strongly advised not to pre-book contractors, plumbers or engage in any preparatory work until you have all your goods and are happy that they are as ordered and damage free. If you are not ready to begin work on your development, goods can be stored in our warehouses free of charge for a period of 2 months from Date Of Order so you can get your plumber scheduled in. Remember we are dealing with fragile products and accidents can happen. If your order is damaged our staff will be as helpful and understanding in resolving any issues. Standard and Large Parcels – Standard and large items will be delivered by Parcel Force courier service. Bulky Delivery (Secure Pallet Delivery) - You will be e-mailed/telephoned with the consignment details directly by the transport company to arrange a suitable time for delivery. 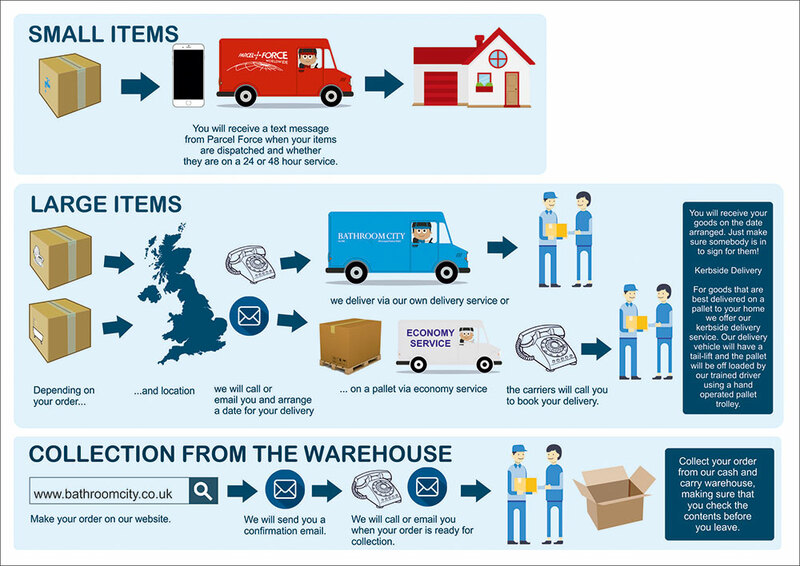 Next Day Delivery – this service is available at a small charge - all customers must check with the sales team that the item is available from stock and available for next day delivery before placing there order. We aim to deliver in 3 - 5 working days for stock items and deliver your order using either Bathroom City vans or a designated distribution company which reached every corner of the United Kingdom. For customers who live in rural areas, farmhouses, manors, country homes and hard to get to places please let us know so we can use a suitable van or a small truck to get through narrow lanes and dirt roads etc. Our carrier vehicles are frequently manned by the driver only so we ask you to provide suitable help in the unloading of heavy or bulky items. As we are not insured whilst on your property delivery's are curbside delivery only, drivers may help at their discretion, please make sure you have help getting the goods into your property. All packaging materials are the responsibility of the customer after delivery. The driver will wait while you check the major components i.e. the bath, pottery etc. There is no need to check robust items such as taps, seats, robustly packaged shower doors and cubicles on delivery. Please check the number of items. We generally allow 48 hours for notification of any issues on these items. In the unlikely event of transit damage, if you accept the delivery or part delivery please sign as damaged. Being located in the Midlands is great news for our customers as we’re not too far from anywhere, allowing all of our customers to collect their order from our cash and carry warehouse if it’s a more convenient option then delivery. Please check all your items on collection for damage of any kind as we are unable to accept goods back after you or your representatives have taken the goods away. Please also be aware that telephone calls between our customer services team, sales and customers are recorded for training purposes. They may also be reviewed for clarity and HR purposes during disputes. When developing a new bathroom, timing the delivery of your bathroom suite with the time you schedule your plumber to begin work can be difficult with time constraints playing a major role: we advise all of our customers to not schedule any work until their order has arrived and has been checked for suitability.